One of the newer prepaid credit cards on the market today is easily found on the Discover network. It’s a great alternative for many who need the convenience of a credit card without the hassles and expense of interest rates, late payments and other charges found on today’s credit cards. No worries about credit checks – since it’s a reloadable card, you don’t have to worry about that and you don’t even need a checking or savings account. And the best part? There are tons of reasons to consider adding this prepaid card to your wallet. Here, we take a look at this card that’s loaded with benefits. As always, though, we encourage you to carefully review any credit card offers before applying. The card itself is free, as is the shipping. The first time you load $50 or more, Discover will add another $5 credit as its way of saying “Thank You.” There are no application fees; you’ll enjoy free direct deposits and free 24/7 customer service – and it’s bilingual should you need it. Further, all of your purchase and balance inquiries are free and you can have notifications sent to your smartphone or email address anytime there’s any activity on your Discover card. Discover has more than 80,000 nationwide ATM locations on its network, too. Finally, because it’s a reloadable credit card, there are no interest rates, annual fees or charges nor late payments. 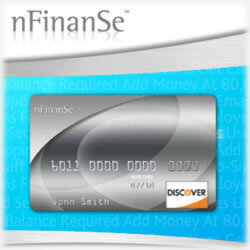 Because the nFinanSE Discover credit card is prepaid, you don’t have the option of a balance transfer, but the opening minimum is only $10, making this a great choice for those just beginning to pick up the pieces of a damaged credit history or for students who are beginning to learn the importance of proper money management. There is a monthly maintenance fee of $2.95 and your reloadable fees are $2.95. Keep in mind, however, direct deposits are always free. This is a safe choice and should your Discover card be lost or stolen, you have the powerful Discover network behind you. They’ll get a new card issued right away, courtesy of the 24 hour customer service team and you’re not responsible for fraudulent charges. Shopping online has never been easier or safer! Discover is a world leader in credit cards and the Discover logo ensures you’re treated with respect anytime you use your Discover card. Additionally, you can avoid ATM fees by using the “Cash Back” option at your favorite supermarket or other retail outlet that offers that option. Plus, the nFinanSE Discover card offers electronic bill pay for just $0.44 per transaction – about the cost of a postage stamp. This is a great option for those who like to pay their bills online or who are too close to their late payment date to wait for traditional mail service to deliver a paper check. You can easily set up automatic recurring payments (ACH) for free. One of the best features with this Discover credit card is that parents can transfer funds from their bank accounts to their student’s card at no cost (it’s treated like a direct deposit). With the cost of college continuing to rise, this is a bonus for parents who are looking for ways to keep costs down. It also allows students to avoid carrying cash to apply to their card, which will incur the standard reload fee. And if you do need to reload funds, you can do so at any participating retailer as well as Western Union and MoneyGram agents. You can find a complete list on the website after you receive your Discover reloadable card. Finally, you can personalize your card too. Be sure to review all the terms and conditions before you apply so that you know the offer well. This really is a great card for students, teens and those who are looking to rebuild their credit. It’s considered a highly ranked card among users, but again, it’s important to carefully review it before you decide – after all, what’s right for one consumer might not be what you ultimately need.